Big Rock Scottish Style Heavy Ale, complete with nifty tartan label. When it opened in the mid 1980s, Alberta’s Big Rock Brewery was an upstart little brewery daring to do things differently in an industry dominated by the likes of Molson and Labatt’s. Since then, it’s grown a whole lot, evolving from a feisty microbrewery to a mainstream craft brewery that has found a mass market appeal while still brewing plenty of tasty beers. 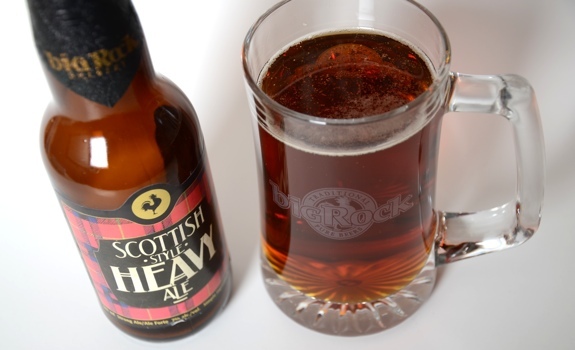 It’s nice to see them acknowledge their quirky microbrewery roots with beers like Big Rock Scottish Style Heavy Ale, part of Big Rock’s Brewmaster’s Series. The Look: Classy. Tartan label design with a black foil wrap around the neck and cap of the bottle. Classic Big Rock lettering. The beer itself is copper, with a head that vanishes quickly. The Taste: Aroma is sweet with caramel. Taste is also sweet, and the alcohol is very present. Big notes of caramel and wood, with some hop bitterness to counter the malty sweetness. Well suited to winter sipping. Pairs With: According to the Big Rock website, “Think of game, roast beef, ham, smoked poultry, strong cheese or a stout haggis.” Personally, I wouldn’t pair it with any desserts. I’d go the cheese route, or possibly a charcoal-grilled burger. Something savoury to beat the sweetness into submission. Cost: $14.99 for a six-pack. I’ve seen it at a couple of shops around Calgary. Value for cash money: Not bad. It’s an interesting beer, and the premium price is worth it. The verdict: Not my favourite beer in the world, but it’s quite nice. An interesting offering from Big Rock. Hmm, ‘well suited to winter sipping’ you say…may have to pick some up then. Currently have two bottles of their Warthog left(from a six-pack). Just a suggestion for the most part, McAuslan Brewery’s St. Ambroise Vintage Ale is great…I’ll need to pick up a couple more. As I understand it, it was brewed in Jan. & has aged since then. But at 10% it could age another year or two. The bottles come in cardboard cannisters, which is nice. Bit more protection from the light & I suppose nice for storage/aging too. This would have to be the BEST beer i’ve ever had – now how do i get it into Australia……….